Subscribe to this news feed. Direct Funding has recently announced a $5 million expansion of the program to allow more people with disabilities to live independently in their home. The Ontario Ministry of Health's announcement increasing funding for Direct Funding, will mean that people who are living independently with a physical disability will be eligible to receive funding for additional services. Late last month, Health Minister Deb Matthews announced an expansion of the province’s direct funding program, which enables people with physical disabilities to manage their own care by hiring their own attendant. 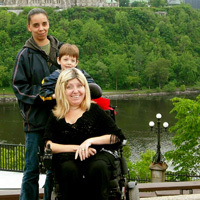 Richard Migneault relies on personal support workers due to his spinal muscular atrophy. He manages his own care through the province's Direct Funding Program. The province is expanding the Direct Funding program, which enables people living with disabilities to manage their care based on their individual needs. The expanded program, supported by $5 million in funding Matthews announced for this year alone, will provide funding to approximately 1,000 Ontarians with physical disabilities by 2016 to help them self-manage their care.